A magnitude-8.1 earthquake struck off the southeastern coast of Hokkaido, Japan, before dawn on Friday. According to the U.S. Geological Survey, the Japanese quake is the strongest to hit anywhere in the world this year. The quake hit at 4:50 a.m. local time, cracking roads, capsizing fishing boats and caving in the roof of an airport. Thousands of people lost power  it has since been restored  and an oil tank at a refinery in the city of Tomakomai went up in flames. Officials said the fire has been extinguished, but that 189,000 barrels of crude oil were lost, according to the Associated Press (AP). No deaths have been reported directly due to the quake, and the varying injury toll is close to 400. But damages are minimal considering how strong the earthquake was, said Yasuhiro Umeda, a seismologist at the Disaster Prevention Research Institute at Kyoto University, according to AP. Initially concerned the quake would lead to dangerous tsunamis, Japan's Meteorological Agency issued a tsunami warning. But with waves reaching just over 4 feet high, the agency downgraded the warning to a caution notice, according to Japan Today. The National Oceanic and Atmospheric Administration's West Coast and Alaska Tsunami Warning Center initially issued a watch for Alaska, British Columbia, Washington, Oregon and California, but has since canceled it. The quake's epicenter was 60 miles off the eastern coast of Hokkaido, and was 21 miles undersea. The epicenter is about 480 miles north-northeast of Tokyo. Four more earthquakes, ranging in size from magnitudes 4.9 to 7.4 followed the main event. The two latest were only 6 miles deep. The AP reports that at least 25 aftershocks have rocked the region. This morning's San Francisco Chronicle reported that just six months ago scientists with Japan's Earthquake Research Promotion Committee forecasted that a magnitude-8.1 quake would hit in this vicinity in the next 30 years. Japan is very tectonically active. 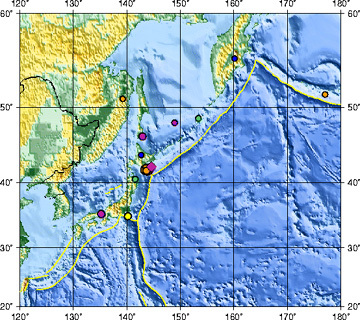 The region where these subduction-related earthquakes hit marks the position where the Pacific plate begins to descend beneath Japan. The epicenter was near the deep ocean trench. This month marked the 80th anniversary of a magnitude-8.3 quake that devastated Tokyo and killed 140,000 in 1923.